If you want to buy a gem, you’d prefer to buy a certified one, correct? And it makes much sense since they don’t really come for the price of candies. Since there is no internationally accepted grading system to grade coloured gemstones, there is also no appropriate answer on how to grade or analyze a gem. Important data like measurements, weight, etc. State of the art gemological equipment and advanced skills are used to determine these characteristics. Let’s go through a Gem Report for a better understanding. Now why all this information becomes important is because it affects both the financial value as well as its durability and appearance. Thus we recommend you to take all this information into account before buying any gemstone. There are situations when this information becomes all the more important for example handling the stone with extra care when treating it to a significant degree. Information such as its origin is not very easy to determine as only a select few laboratories have access to such advanced equipment. Treatments or enhancements performed on the gemstone. Gemmological Institute of America (Mumbai), IGI (India) and Gem Testing Laboratory (India) are some of the renowned laboratories in the country which deal in grading gemstones. They examine their characteristics like type of gemstone, its authenticity (natural or synthetic) and also the information on various methods to enhance its appearance. So these more or less cover all the critical points to which comes under the guide to buy the right stone as all the major national and international laboratories use these points to certify the gems. At MyRatna, we believe in selling only certified and genuine gemstones. Our Head-Office is well equipped with state of the art equipment and experienced and well-qualified gemologists for efficiently grading all the gemstones. Moreover, our gemologists keep doing research work continuously to keep themselves updated with the latest knowledge in their are thus ensuring 100% genuine reports of the tested gemstone. 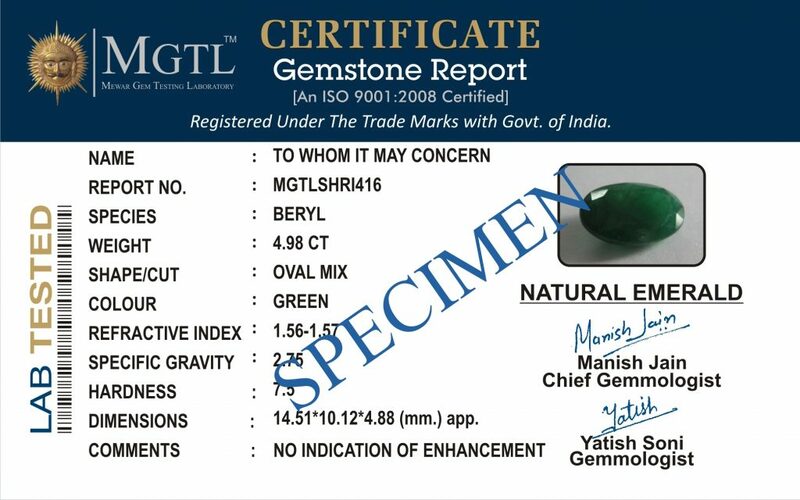 Every gemstone you buy from MyRatna comes with a MGTL Certificate. We also offer certification from IGI, GIA, GRS, GII, GTLJ and from various other internationally renowned laboratories for our exclusive range of gemstones. So don’t forget to get the gemstone certified the next time you plan to purchase one.